Keystroke Studios is a full-service graphic arts service. We can create stationery, ads, brochures, banners, or anything else that needs to be put into print. Printed materials can be an integral part of a Web marketing campaign, or can be designed to stand alone. Each of our Web sites has tailor-made graphics and a customized design. Our goal is to develop clean and exquisitely usable sites that serve the needs of their visitors while enhancing the businesses they represent. See our portfolio to view some of the sites that we have designed and developed. Blogs, FaceBook, Twitter, Email Newsletters, Wikis  they can boost your business as well as your site's search engine rankings. If you wish, we will arrange for site hosting and for obtaining a domain name for your business. We can enable your business to make sales online, whether you are offering one product or thousands. 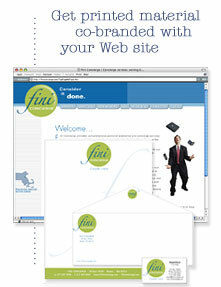 Need stationery, business cards, or PowerPoint templates to go with your Web site? We'll make sure your corporate image is aligned among all the places it appears. We will work closely with you to ensure that your site is properly constructed to maximize its visibility to potential visitors. We will register your Web site with the top search engines, and monitor your site's results. We can also help you with offline promotion. As central aspect of our business we offer ongoing Web services, including content management, updates, upgrades, and advice.